A commercial airplane encounter with volcanic ash can threaten safety of flight because of resulting conditions that range from windshield pitting to loss of thrust in all engines. Developments in technology and communication networks have significantly decreased the probability of such an encounter in the last several years. Despite these developments, however, a 737-700 recently flew through a volcanic ash cloud. Updated information about advancements made in ensuring safe operations and minimizing damage to the airplane during a volcanic ash encounter is now available to flight crews. In the past 30 years, more than 90 jet-powered commercial airplanes have encountered clouds of volcanic ash and suffered damage as a result. The increased availability of satellites and the technology to transform satellite data into useful information for operators have reduced the number of volcanic ash encounters. However, further coordination and cooperation, including linking operators and their dispatchers to the network of government volcano observers, is required throughout the industry. Boeing has always advocated that flight crews avoid volcanic ash clouds or exit them immediately if an encounter occurs. The company also recommends specific procedures for flight crews to follow if they cannot avoid an encounter. Results of past events involving volcanic ash. Resources available to help avoid ash encounters. Specific flight crew actions required in response to encounters. Significant ash encounters from the past include those involving such well-known volcanoes as Mt. Pinatubo, Mt. Redoubt, and Mt. St. Helens. The airplanes that encountered volcanic ash during these events and in the other events listed chronologically experienced varying degrees of damage. Mt. St. Helens, United States, 1980. A 727 and a DC-8 encountered separate ash clouds during this major eruption. Both airplanes experienced damage to their windshields and to several systems, but both landed safely despite the windshield damage. Several 747s encountered ash from this eruption. One airplane lost thrust from all four engines and descended from 36,000 ft to 12,500 ft before all four engines were restarted. The airplane, on a flight from Kuala Lumpur, Malaysia, to Perth, Australia, diverted to Jakarta and landed safely despite major engine damage. This airplane subsequently had all four engines replaced before returning to service. A few days after the initial encounters, another 747 flew into the ash cloud and suffered significant engine damage. This airplane also diverted to Jakarta and subsequently performed a successful two-engine landing. Mt. Redoubt, United States, 1989. On a flight from Amsterdam to Anchorage, Alaska, a new 747-400 (only three months old with approximately 900 hr total flying time) encountered an ash cloud from the erupting Mt. Redoubt near Anchorage. All four engines ingested ash and flamed out. The crew successfully restarted the engines and landed safely at Anchorage. All four engines were replaced and many airplane systems also had to be repaired or replaced. For example, the airplane environmental control system was replaced, the fuel tanks were cleaned, and the hydraulic systems were repaired. Several other airplanes encountered ash from this eruption, but most damage was minor because operators had been notified of the eruption. Some operators, such as Alaska Airlines, continued scheduled flights once they developed processes to safely identify where ash might be encountered. Although information was available about the Mt. Redoubt eruption, the channels for sharing this information were not well developed at the time (see �Alaska Airlines Procedures for Operating in Volcanic Ash Conditions�). More than 20 volcanic ash encounters occurred after the Mt. Pinatubo eruption, which was the largest volcanic eruption of the past 50 years. The ability to predict where ash was to be found was challenging because of the enormous extent of the ash cloud. Commercial flights and various military operations were affected; one U.S. operator grounded its airplanes in Manila for several days. This volcano affected several flights in 1997 and 1998. Although damage was minor in most cases, one flight crew experienced significantly reduced visibility for landing and had to look through the flight deck side windows to taxi after landing. In addition, the airport in Mexico City was closed for up to 24 hr on several occasions during subsequent intermittent eruptions. One of the outcomes of this initial meeting is the availability of today�s Volcanic Ash Advisory Centers (VAAC). The VAACs provide an important link among volcano observatories, meteorological agencies, air traffic control centers, and operators. A total of nine VAACs observe and report on a particular region of the world (fig. 1). One product of the VAACs is the Volcanic Ash Advisory Statement (VAAS). Below is an example of a VAAS for a recent event in 1999. In addition to providing VAASs directly to the airlines, the VAACs also provide information to appropriate meteorological organizations that subsequently issue significant meteorological information (SIGMET) and other reports. The ICAO publication �International Airways Volcano Watch� (ICAO annex III) contains further information and contact names and numbers. Detailed information on the VAACs, including contacts for each of the nine centers, is available at http://www.ssd.noaa.gov/VAAC/. Operators rely on the VAACs for information, and many operators maintain direct contact with volcano observatories within their flight domains. For instance, the Alaska Volcano Observatory (AVO) in Anchorage, with links to Fairbanks, issues a weekly bulletin by e-mail and fax detailing the activity of key volcanoes in Alaska. During periods of volcanic unrest and eruption, bulletins are issued frequently as conditions change. Anyone can request to be placed on distribution for the bulletins. The AVO web site (http://www.avo.alaska.edu/) also provides updated information. For those without Internet access or unable to access the site if it is overloaded during a crisis, the AVO daily telephone recording at 907-786-7477 provides brief updated information for air carriers. Finally, many operators maintain personal relationships with individuals in the volcano observatories that monitor volcanoes within a particular flight domain. For instance, Alaska Airlines maintains contact with key individuals at the AVO because a significant portion of Alaska�s flight domain could be affected by Alaskan volcanoes. Many other web sites provide information and links to other sources of volcano information (see �Volcanic Ash Resources�). A wealth of printed information, such as the Bulletin of the Global Volcanism Network through the Smithsonian National Museum of Natural History in Washington, D.C., is also available. However, the information about current volcanic activity in these printed sources is often two to three months old. Despite ongoing avoidance efforts, operators can still experience volcanic ash encounters. Guidance on the operational issues surrounding volcanic ash is divided into three aspects: avoidance, recognition, and procedures. The following information is general; flight crews should refer to their respective company�s operating manuals for details. 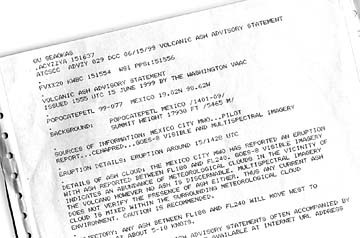 Dispatch needs to provide flight crews with information about volcanic events, such as potentially eruptive volcanoes and known ash sightings, that could affect a particular route (see sidebar page). Dispatch also needs to identify alternate routes to help flight crews avoid airspace containing volcanic ash. Flight crews should stay upwind of volcanic ash and dust. Flight crews should note that airborne weather radar is ineffective for distinguishing ash and small dust particles. Indicators that an airplane is penetrating volcanic ash are related to odor, haze, changing engine conditions, airspeed, pressurization, and static discharges. Odor. When encountering a volcanic ash cloud, flight crews usually notice a smoky or acrid odor that can smell like electrical smoke, burned dust, or sulfur. Haze. Most flight crews, as well as cabin crew or passengers, see a haze develop within the airplane. Dust can settle on surfaces. Changing engine conditions. Surging, torching from the tailpipe, and flameouts can occur. Engine temperatures can change unexpectedly, and a white glow can appear at the engine inlet. Airspeed. If volcanic ash fouls the pitot tube, the indicated airspeed can decrease or fluctuate erratically. Pressurization. Cabin pressure can change, including possible loss of cabin pressurization. Static discharges. A phenomenon similar to St. Elmo�s fire or glow can occur. In these instances, blue-colored sparks can appear to flow up the outside of the windshield or a white glow can appear at the leading edges of the wings or at the front of the engine inlets. The following nine procedures are general recommendations. Each operator�s flight operations manuals will include more specific directions. Reduce thrust to idle immediately. By reducing thrust, engines may suffer less buildup of molten debris on turbine blades and hot-section components. Idle thrust allows engines to continue producing electrical power, bleed air for pressurization, and hydraulic power for airplane control. Turn the autothrottles off. This prevents the engines from increasing thrust above idle. Ash debris in the engine can result in reduced surge margins, and limiting the number of thrust adjustments improves the chances of engine recovery. Exit the ash cloud as quickly as possible. A 180-deg turn out of the ash cloud using a descending turn is the quickest exit strategy. Many ash clouds extend for hundreds of miles, so assuming that the encounter will end shortly can be false. Climbing out of the ash could result in increased engine debris buildup as the result of increased temperatures. The increased engine buildup can cause total thrust loss. Turn on engine and wing anti-ice devices and all air-conditioning packs. These actions improve the engine stall margins by increasing the flow of bleed air. If possible, start the auxiliary power unit (APU). The APU can power systems in the event of a multiple-engine power loss. It can also be used to restart engines through the use of APU bleed air. If volcanic dust fills the flight deck, the crew may need to use oxygen. Use flight deck oxygen at the 100 percent setting. Manual deployment of the passenger oxygen system is not required because it will deploy automatically if the cabin altitude exceeds 14,000 ft. Turn on the continuous ignition. Confirm that autostart is on, if available. In the event that the engines flame out or stall, use appropriate procedures to restart the engines. During restart, the engines may take longer than normal to reach idle thrust due to the combined effects of high altitude and volcanic ash ingestion. If an engine fails to start, try restarting it again immediately. Flight crews should remember that the airplane may be out of the airstart envelope if the encounter occurs during cruise. Monitor engine exhaust gas temperature (EGT). Because of potential engine debris buildup, the EGT can climb excessively. The flight crew should prevent EGT exceedances. Shut down the engine and restart it if the EGT is approaching limits similar to a hung start. Fly the airplane by monitoring airspeed and pitch attitude. If necessary, follow the procedure for flight with unreliable airspeed. Though the number of commercial airplane encounters with volcanic ash clouds has decreased significantly over the past several years, the potential for this type of event still exists. Efforts to advance knowledge about how to avoid and recover from these encounters have resulted in improved capability in these areas. By working with members of the volcanological community, the aviation industry has developed procedures to share information about events with flight crews, dispatchers, volcano scientists, and others. Volcano observatories that provide daily updates through e-mail messages or phone recordings have been established. In addition, a variety of Internet sources provide information that operators can tailor to their specific flight domains. Finally, flight operations procedures are documented and available to flight crews to help them respond immediately and appropriately to maintain the highest possible level of flight safety. For additional information please see the sidebar page. Aero Copyright © The Boeing Company. All rights reserved.